Can IRs Provide Too Much Of A Good Thing? I love IRs; they can save me literally hours of work on guitar-heavy projects and deliver great results every time. Over the years, I’ve acquired a lot of different options and I know that sometimes the vast choice of cabinets, speakers and mics can seem a little overwhelming – so, let’s take a look at how to get around that. We all know that the speaker and mic combination has a huge effect on the sound of our amps. Up to a point, lots of options can be good, but past that, they can start to sound a bit similar… and it’s very easy to vanish down the wormhole of trying to choose one from several different sounds that are almost identical. Do this for an hour or so trying to decide which is the ‘best’ and that acoustic guitar part can start to look pretty good! But Sometimes They Sound Completely Different! Two IRs recorded with the same mic, in positions a cm apart, on the same speaker, in the same cab, may sound pretty similar, but a distant condenser mic on an open back 1×10 with an Alnico speaker in an aircraft hanger is going to sound massively different to an oversized 4×12 loaded with V30s and close mic’d with an SM57 and a 121. Different IRs, and especially different manufacturers’ IRs can completely change our guitar sound – and it’s very easy to become so disorientated that we lose track of what we’re chasing. Planning and preparation – it really doesn’t sound like a lot of fun but it’s pretty simple. What do I need to see when I open my Impulse Response Library? Do I need to have easy access to every free and bought sample I’ve ever downloaded? Or all of the different sample-rate/IR length options? Or all of the hardware device IRs? No, I don’t. So, I’ll copy just the useful stuff to a new folder and archive the original libraries. Out of all of the hundreds of IRs I have, I only use a dozen or so for most things that I do. I tend to hear guitar sounds in a certain way and some years ago, I copied a set of favourites into a ‘Best Of’ folder. Where I had a group of very similar sounds, I just picked one and then didn’t worry about it – EQ works just as well on guitar parts played through IRs as it does with real speakers for when I need to do a bit of fine-tuning! Today, I use a lot of CelestionPlus IRs which come ready-sorted – the libraries contain a set of options for each speaker/cab/mic with file names that are easy to read, and that have enough difference between them to make it simple to choose one. I still have my one or two favourites but they’re easy enough to find that I generally just use them as they come. What’s a ‘Mix Decision’? Well, as a guitar player, I know what I think a guitar part should sound like and I have a pretty good idea of what gear I’m going to use to get it. If I change to a totally different speaker set-up it sounds wrong at first, but then as I get used to the new sound, it starts to make sense – even when it’s completely different to what I originally wanted. By thinking as a mixer instead of a guitar player, I’ll play the part in the context of the mix and just skip between my sets of different options until I find a sound that’s ‘right’ against my other tracks – it doesn’t matter what it’s an IR of, the one that sounds good wins with no over-thinking needed. I have a bunch of guitar cabs sitting behind me: 1×12, 2×12, 4×12, open, closed, semi-open – all of them happen to have Celestion speakers in them and I generally know which ones I like with which of my amps, and how I like to mic them. IRs give me many more options than I could afford to buy (or store!) in the real world, but it is easy to get overwhelmed. 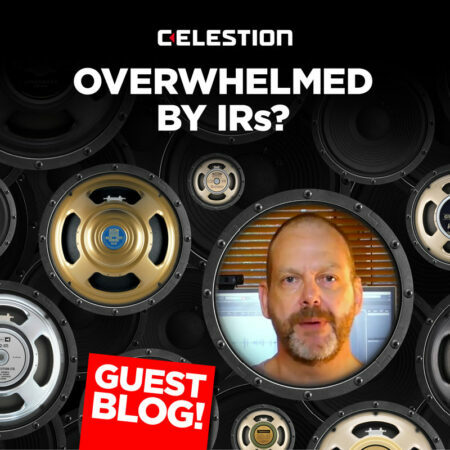 Sure, it took me a few hours of downtime to sort and tidy all of my original libraries, but if I was starting to use IRs today, knowing what I’ve learned along the way, I’d just grab the CelestionPlus libraries that match the speakers that I own (or would like to own), find the ‘…….. All Celestion’ IR for each cab type as a starting point and get on with making music – there’s plenty of time to play after the work’s all done. Check out CelestionPlus’ huge range of IRs, painstakingly recorded using their legendary range of guitar and bass speakers.